(AP Photo/Frank Gunn, File) Fireworks burst over the athlete tribune at the Rice-Eccles Olympic Stadium in Salt Lake City during the opening ceremonies Feb. 8, 2002, for the 2002 Olympic Winter Games. An exploratory committee has voted to recommend that Utah bid to host another Winter Olympics in 2030. Utah will bid to host the Olympic and Paralympic Winter Games in 2030 — but the state may get to make its case for welcoming the world again even sooner. If the U.S. Olympic Committee decides by March 31 to pursue the 2026 Winter Games — and designates Salt Lake City as its “interested” city — advisers recommended Wednesday that Utah should establish a candidature committee to pursue the opportunity. Utahns seem to agree, with 83 percent of residents statewide saying they support Salt Lake City seeking to host the 2030 Games, according to a new poll for The Salt Lake Tribune and the University of Utah’s Hinckley Institute of Politics. A new poll shows substantial support for efforts by Salt Lake City and the state to play host to the Winter Olympics in 2030 or, if need be, in 2026. An exploratory committee made that recommendation Wednesday, when Gov. 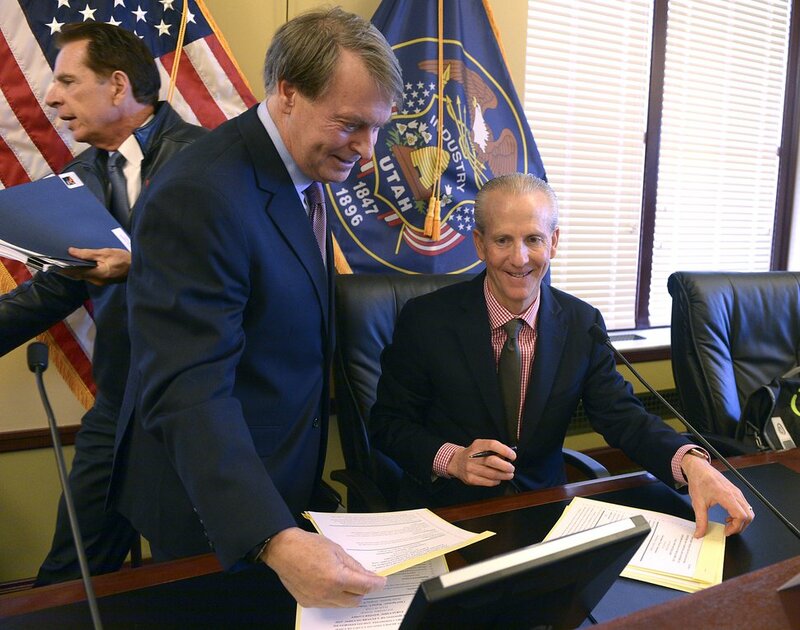 Gary Herbert signed a resolution the Legislature passed the day before to support a bid. Q: Do you support or oppose Salt Lake City seeking to host the 2030 Winter Olympic Games? Source: Dan Jones & Associates talked to 803 registered Utah voters from Jan. 15 to 18. The poll has a margin of error of +/- 3.5 percentage points. The exploratory committee had previously determined it would cost about $1.29 billion for Utah to again host the Games — less than the $1.389 billion tab for 2002. The USOC has until the end of March to submit a bid city for the International Olympic Committee’s next round of selections, which is seeking a host city for the 2026 Winter Games. But since the IOC recently made a dual award of upcoming Summer Olympics — giving 2024 to Paris and 2028 to Los Angeles — Utah’s Olympic leaders anticipate a similar approach may be used to pick sites for the 2026 and 2030 Winter Games. To be in the running for 2030, that means the USOC would have to enter Salt Lake City into the 2026 race. State Sen. President Wayne Niederhauser said earlier that bidding for 2026 may be difficult because Los Angeles already has the 2028 Summer Games and “has the rights to all sponsorships” for the Olympics through then. (Leah Hogsten | The Salt Lake Tribune) Olympic/Paralympic Exploratory Committee Board member Fraser Bullock and fellow members of the Salt Lake Olympic Exploratory Committee voted Wednesday to recommend that Utah should pursue hosting the Olympic and Paralympic Winter Games in 2030. If the U.S. Olympic Committee decides by March 31 to pursue the Games for 2026, and selects Salt Lake City as an interested city, the committee recommended that Utah leaders consider taking the next steps, including forming a candidature committee to pursue the opportunity, Wednesday, February 7, 2018. Bullock and Robbins will lead a small Utah delegation to the Winter Olympics that begin Friday in Pyeongchang, South Korea. Since the 2002 Games ended, Bullock has been an important adviser to the IOC and other cities preparing to host Winter Games, and he will be meeting with IOC and USOC officials during his stay in South Korea. 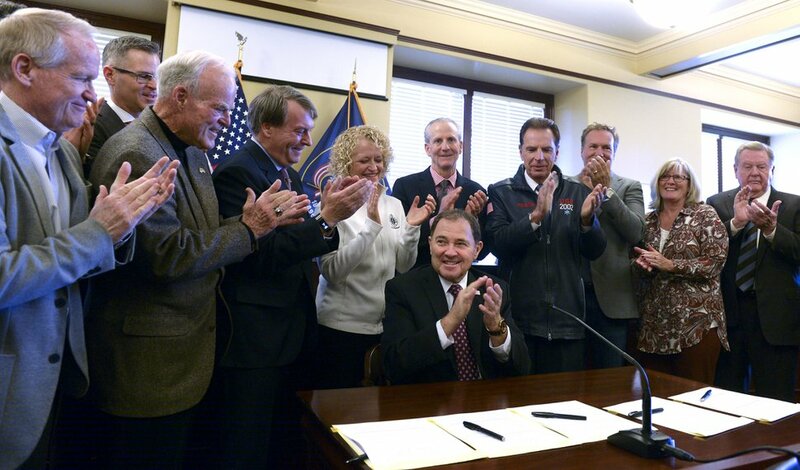 When Herbert signed documents Wednesday, completing the paperwork behind Utah’s reinvigorated Olympic aspirations, cheers and applause filled a crowded meeting room at the state Capitol. The Tribune poll showed support for another Olympic bid crosses all boundaries — age, gender, political and religious affiliations, and education levels. Almost as many very liberal people back a bid as very conservative folks. In no category did “strong opposition” exceed 7 percent. Dan Jones & Associates surveyed 803 registered voters Jan. 15-18 and the poll had a margin of error of 3.5 percent. (Leah Hogsten | The Salt Lake Tribune) Gov. Gary R. Herbert, center, surrounded members Olympic/Paralympic Exploratory Committee Board Meeting after signing SCR009. The Salt Lake Olympic Exploratory Committee voted Wednesday to recommend that Utah should pursue hosting the Olympic and Paralympic Winter Games in 2030. If the U.S. Olympic Committee decides by March 31 to pursue the Games for 2026, and selects Salt Lake City as an interested city, the committee recommended that Utah leaders consider taking the next steps, including forming a candidature committee to pursue the opportunity, Wednesday, February 7, 2018. 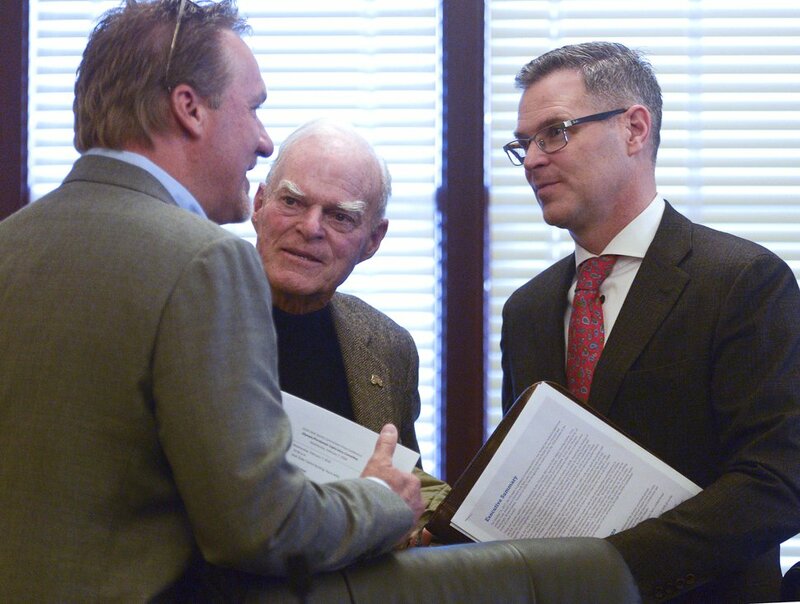 The honor of making the motion to approve the committee’s recommendations was extended to retired banker and philanthropist Spencer Eccles Sr., a major force behind launching Salt Lake City’s last Olympic bid in the late 1980s. 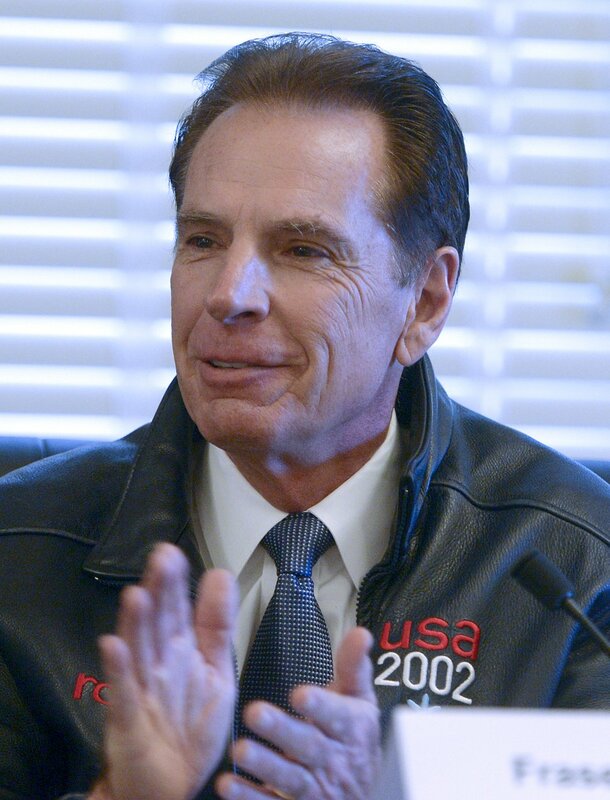 (Leah Hogsten | The Salt Lake Tribune) Olympic/Paralympic Exploratory Committee Board members Steve Layton, Spencer F. Eccles and Spencer P. Eccles voted Wednesday to recommend that Utah should pursue hosting the Olympic and Paralympic Winter Games in 2030. If the U.S. Olympic Committee decides by March 31 to pursue the Games for 2026, and selects Salt Lake City as an interested city, the committee recommended that Utah leaders consider taking the next steps, including forming a candidature committee to pursue the opportunity, Wednesday, February 7, 2018. Votes for the recommendation came from as far away as South Korea, where exploratory committee member and Olympic silver medalist Noelle Pikus Pace was part of the USOC contingent welcoming American athletes to the 2018 Winter Games. The committee prepared a 140-page report to back up its position. Noting that he is a CPA by trade and a man who appreciates numbers, Niederhauser said he was most impressed by the data supporting the notion that Utah can put on a Winter Olympics cheaper and more efficiently than anywhere else. Niederhauser also said the state will upgrade existing Olympic venues to keep them ready for elite competition, adding the state has lived up to the goal it set in the first Olympic go-round — to become the center of winter sports in the United States — by keeping its venues in continual use by premier and recreational athletes. (Leah Hogsten | The Salt Lake Tribune) l-r Olympic/Paralympic Exploratory Committee Board member Jeff Robbins jokes with Senate president Wayne Niederhauser after the Salt Lake Olympic Exploratory Committee voted Wednesday to recommend that Utah should pursue hosting the Olympic and Paralympic Winter Games in 2030. If the U.S. Olympic Committee decides by March 31 to pursue the Games for 2026, and selects Salt Lake City as an interested city, the committee recommended that Utah leaders consider taking the next steps, including forming a candidature committee to pursue the opportunity, Wednesday, February 7, 2018. Robbins noted that Utahns show a level of support for a repeat Olympics bid that is unmatched in cities around the globe. A number of cities, including former 2026 favorite Innsbruck in Austria, have rejected efforts to stage the Games because of their anticipated costs. The IOC is scheduled to award the 2026 Winter Olympics in September 2019. To see complete copies of the exploratory committee’s report, go to https://utahsportscommission.com or https://utaholympiclegacy.org.